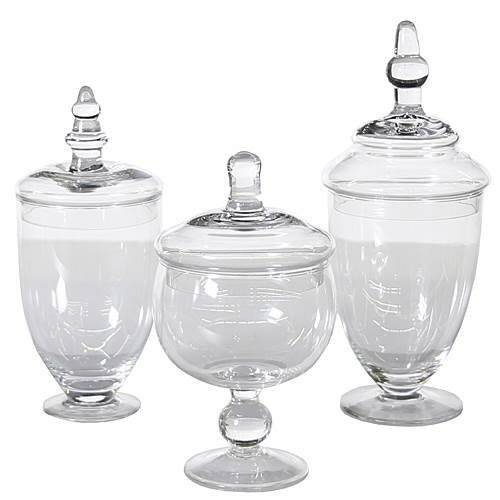 These medium sized glass apothecary jars are perfect in a bathroom to hold cotton balls, Q-tips, bath salts, bath bombs for bathroom decor. These can be used to hold candy, marshmallows, cocoa, etc for a party. Add bath salts or bath bombs or candy to an apothecary jar and give as a gift! Apothecary jars dress up many rooms with home decor fillers. Available in your choice of 3 sizes: 11" tall x 4" diameter (pictured on the right); 9" tall x 4" diameter (pictured left); or 8" tall x 4" diameter round (pictured front).